Kim Raff | The Salt Lake Tribune University of Utah gymnast Georgia Dabritz performs a beam routine during a meet against Stanford at the Huntsman Center in Salt Lake City on February 23, 2013. Rick Egan | The Salt Lake Tribune Tory Wilson competes on the bars for the Ute's, in gymnastics action against The University of California, at the Huntsman Center, Saturday, February 9, 2013. 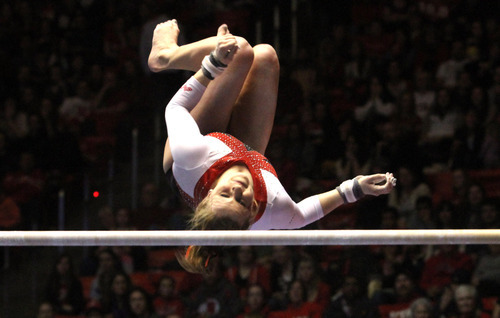 The national rankings didn&apos;t do Utah&apos;s gymnastics team any favors this week as the Utes are ranked just ahead of Georgia in the Top 10. The No. 7 Utes travel to Georgia for a meet Saturday. That they are ranked ahead of Georgia, even if it is by a mere 0.015 of a point, might give the Utes some confidence too. But they also know it will add a bit of extra spice to an often already heated rivalry. Some of the intensity has lessened since coach Suzanne Yoculan&apos;s retirement, but the Utes still know Georgia&apos;s crowd will be hostile, especially with the Utes ranked ahead of the Dawgs, regardless of how slight the margin is. Utah coach Greg Marsden just laughed at the circumstances. "I&apos;m not sure that makes us a favorite," he said. "If people really think that is going to make a difference, they haven&apos;t been to a Georgia gymnastics meet before. It is always tough to beat Georgia anywhere, but it&apos;s really tough to beat them at home." The good news for the Utes is they are coming off their best road meet of the year, having scored a 197.125 at BYU for their highest regular season road mark since 2009. Finally, with just two meets left before the postseason run, the Utes feel they not only have the skills but also the mental toughness to compete well on the road. "We know we can go on the road and do well," Tory Wilson said. "It&apos;s definitely exciting for us." Marsden isn&apos;t planning any changes to the balance beam lineup even though most of Utah&apos;s issues are coming later in the rotation, with both Kassandra Lopez and Georgia Dabritz struggling to be consistent. While others are steadier, Marsden likes having Lopez, Dabritz and Mary Beth Lofgren finish out the lineup because they have more potential for bigger scores. "In the postseason, if we want to be competing at the level we hope to be, we are going to need those three there to get the higher scores," he said. Marsden praised Lofgren for delivering some big scores in the anchor spot when others have fallen. Dabritz, meanwhile, admitted she is disappointed some of the mental issues she had on the balance beam a year ago are still with her this season. She has had three falls off the apparatus and some shaky routines. "I&apos;ve been working on my confidence and I am doing better in practice," she said. "I just need to be confident enough to go out there and do it in competition."